It’s that time of year when we start dreaming of the World Series. And while everyone focuses on the great season the Chicago Cubs are having and how hot Boston is right now, we may be overlooking the best team in baseball since late June — the Cleveland Indians. The Indians got off to a middling start, sitting at 10-12 as of May 1. But thanks to a fantastic month of June and a pretty great September so far, they’ve gone 79-51 since. Cleveland has the best home record in the American League. With three straight wins and six in the last 10, this team has pretty much blown the Tigers away in the AL Central. With a magic number of four, the Indians are about to wrap up their first division title in nearly a decade. One of the biggest reasons? After going 9-10 against the Royals last year, Cleveland is 9-1 vs. KC this season. The Tribe ranks second in the AL in runs scored and has given up the least amount of runs. And they’ve done this all despite season-ending injuries to Michael Brantley, Jan Gomes, Carlos Carrasco and Danny Salazar. Obviously, the losses of Carrasco and Salazar really put a dent in Cleveland’s playoff hopes given how important pitching is in a short series. After all, as much of a workhorse as he is, Corey Kluber can’t pitch every night. So it’s likely going to take yeoman’s work from the likes of starters Trevor Bauer and Josh Tomlin for this team to advance, regardless of a very powerful offense and stellar bullpen. But hey, now that the Cavaliers have broken the championship seal for Cleveland, anything’s possible. First baseman Carlos Santana has pretty much put the team on his back over this fine September run. He doubled, homered and walked Thursday, driving in four runs, giving him hits in four straight games and six of seven, batting .428 over that stretch (perhaps because his dad is in town — see video below). Over the last four games, he has five runs, three homers, three doubles and seven RBI. Smoking! The 30-year-old Dominican is having his best month of the season, slashing .310/.451/.634 with five doubles and six dingers, capping perhaps his finest campaign. Santana has been unable to duplicate last year’s out-of-nowhere 11-steal performance, but is otherwise passing or closing in on several career highs, including putting up his first 30-homer effort. 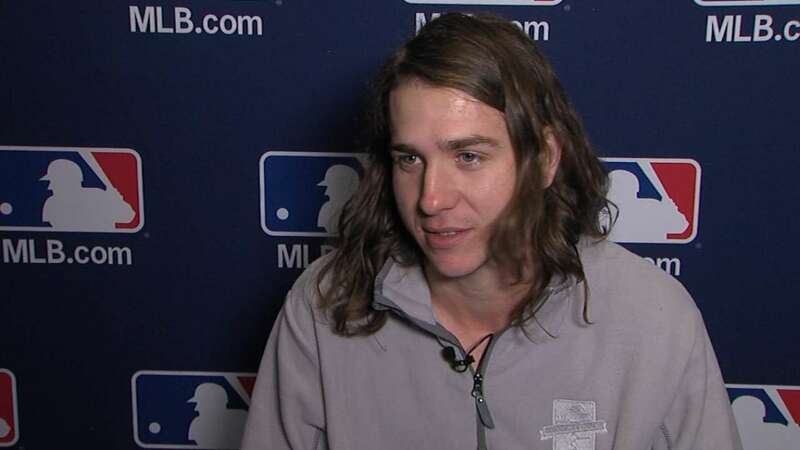 As mentioned, with the rotation depleted by injuries, Cleveland will need more efforts like those recently put up by rookie Mike Clevinger (who, incidentally, looks like the kind of dude you’d share a bong with in your parent’s basement). The Angels’ fourth round pick in 2011 enjoyed really fine results in his first season at Triple-A despite a higher walk rate. Promoted to Cleveland several times, Clevinger mostly struggled, but he’s looked much better since being moved back into the rotation this month. After limiting KC to four hits and two runs over five innings Thursday, he has now allowed just nine hits and four earned runs over his last 13 innings, covering three starts, fanning 12 and walking five. In just over a month, Clevinger has managed to shave over a run off his ERA, and while he’s no one’s idea of an inning hog, he’s become a serviceable MLB starter — at the time when this team needs one of the most. 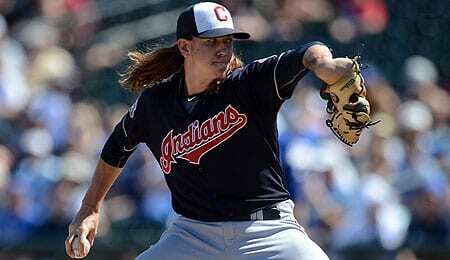 We alluded to Cleveland’s stellar bullpen earlier. One of the unsung heroes has been Dan Otero. He was so bad last year that he had to spend a chunk of the season at Triple-A, where he was dominant. Back in the bigs this year, Otero pitched like he never wanted to leave. On Thursday, he earned his fifth win by hurling two scoreless innings, his third straight scoreless outing. September (3.12 ERA) has actually been a rough month for Otero considering the rest of his season: 0.00 in April; 1.23 in May; 1.13 in June; 2.19 in July; and 1.10 in August. His walk rate is up this season, but his control remains superb, so it’s hardly been a concern during this career year. For the last four years, Bryan Shaw has been extremely consistent as a setup option for Cleveland. He’s worked harder this season, and while his bottom line results haven’t been quite as good, he’s averaging over a K per inning for the first time and has matched his career high in holds. The fact that Shaw’s numbers are right in line with what we expect despite an awful start is a real testament to his consistency. Since the All-Star break, he has a 1.84 ERA and has held opponents to a .206 BAA. At the back end of the pen, Cody Allen continues to thrive as a closer despite the team adding Andrew Miller at the deadline. Allen nailed down his 29th save with a perfect inning on Thursday, his 11th scoreless outings in the last 12 appearances. He had a rough August, but has definitely righted the ship this month and has never been harder to hit than he’s been this season. So what if Allen has matched his career high in losses? He’s a tremendously steady Fantasy option. Now it’s your turn. Let us know in the comments below how you think the Cleveland Indians will fare in the 2016 playoffs. This entry was posted on Friday, September 23rd, 2016 at 12:13 pm	and is filed under BASEBALL, RotoRob, Team report. You can follow any responses to this entry through the RSS 2.0 feed. Both comments and pings are currently closed.